He's growing corn again in the field by my old house. Been a few years since it was planted last. Leafy green contrails lolling behind. All of this regrowth comforts me. A crop rotation is patience. a Good Farmer must envision the layers yet to come. and know it's worth the wait. There is no nostalgia for a Good Farmer. and only grows further away. It is almost embarrassing how many posts I've done over the last five years that all in some way relate to the men's locker room. There are even multiple story lines going on at this point. One story line began way back in February of 2010, and it involved a hairy but wonderful man who was in the foul habit of hanging his dirty wet bathing suit on the outside of his assigned locker. You can read about him here. Eventually, I got so perturbed by this imposition that I began tying knots in the strings of the suit. At some point, it even felt like I was not the only one in on the game. As time went on, my misdeeds came back to me in the form of back pain and then later surgery. I'm not usually this hokey about karma, but I had wronged and I was willing to take my punishment. Not only did I take it, I learned from it. That was the last time I even thought about terrorizing fellow locker-goers, and I simultaneously decided to stop writing about specific people in the locker room. Until now . . . When I was in high school, my family and I took a trip to Chicago to visit my paternal grandmother. As younger kids we often took trips to the Midwest to see my father's relatives, but as my brother and I got older the frequency of these trips fell off. I was still too young to understand the politics of families of origin, so I just assumed the downtick in travel was random. It had been a good five years since I had been to the Windy City, and as a 16-year-old, a plethora of new family friendly activities were available. Having visited the Museum of Science and Industry on our last visit, I cast my vote for the Museum of Contemporary Art. My choice had less to do with an affinity for modern art and more to do with a firm distaste for old portraits of America's White forefathers. 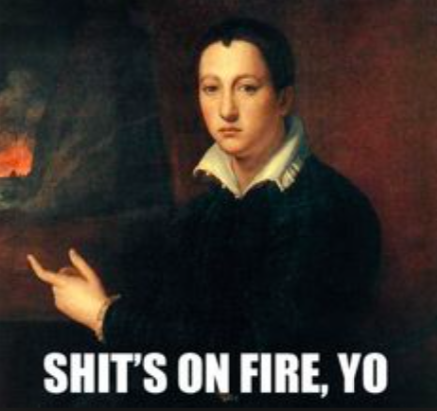 As you might imagine, my Mom and Dad had a parentgasm at the sound of their child asking after modern art. During these celebrations they never paused to remember that they had already banned anything "fun" like going to the movies or an arcade. "You can do that at home," they'd reply. "But you don't let me!" I'd snap back defiantly. To my displeasure, the topic was no longer open for discussion. My new library is much more grand than the last one. It exceeds its predecessor in both stories and stories. The carpeted floors creak like the hallway of your family's house. The wooden panels giving way in sound rather than in movement to the countless footsteps of history that pitter-patter and click-clack unaware upon the threadbare oriental rug. 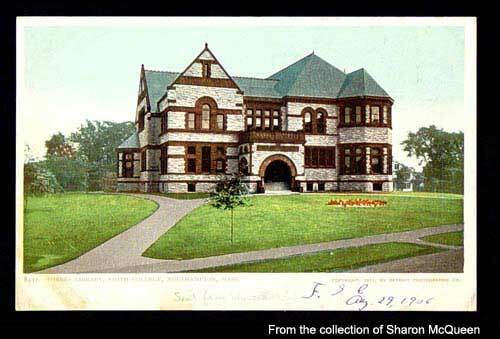 Constructed in 1896, this postcard is dated "Aug 29, 1906"
My new library smells like the cumulative human experience; like a mold problem that was discovered and taken care of. The wood banisters in the stairwell slide across my fingers as if they came from the past and will carry up up up into the future. There are books, of course. But the books are merely wallpaper towards a greater end. A marketplace of realness where you can find free internet and chairs to sit in. We are all equals at the library, all they ask is that you stay within the boundaries of polite etiquette. an oak tree in the moonlight. No leaves, but acorn rich. Many of my long time readers will remember my series of pieces all set in the locker room of the UMass pool gymnasium. To be clear, I'm not talking about the new multi-million dollar Athletic Center where everyone on campus goes to exercise, but rather the building that now holds only squash courts, physical fitness classrooms, and a state of the art pool that seems totally out of place. The pool is the last remaining sentinel of the gym that came before. This used to be where students worked out 20 years ago, but now the place is deserted save for the swimmers forced into occupancy because of the lack of an aquatic center in the new building . . . so far. As it stands, the locker room is an elephant graveyard of grey beaten lockers, and the shower room is straight out of a Revenge of the Nerds script. A few weeks ago I signed up for my summer membership at the pool, and was handed a padlock and a locker number. 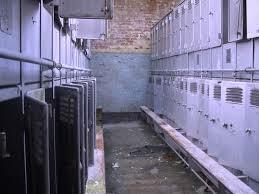 I loaded my suit, towel, and deodorant into the locker that time forgot. I wrote the combination on the back of my Faculty ID. Last Thursday was my fourth visit to the pool. As I flopped down on the bench in front of my locker, my eyes were still fighting against gravity's insistence that they close. Once I hit the water, gravity's force would no longer apply to me. My weightlessness in water kept the lids permanently lifted. These were the benefits of weekly exercise and a surge of adrenaline. I twisted the padlock to zero. I got lucky in this regard, my combination actually starts with zero -- so centering the dial served a double purpose. I lazily cranked the dial around to the next two numbers and then yanked downward. Nothing. I repeated the sequence again with the same result. The third attempt I held the lock in my left hand as I carefully entered the combination. I pulled harder than was necessary. Still locked.